Our teeth have intriguing stories to tell. These sophisticated time machines record growth, diet, and evolutionary history as clearly as tree rings map a redwood's lifespan. Each day of childhood is etched into tooth crowns and roots--capturing birth, nursing history, environmental clues, and illnesses. The study of ancient, fossilized teeth sheds light on how our ancestors grew up, how we evolved, and how prehistoric cultural transitions continue to affect humans today. 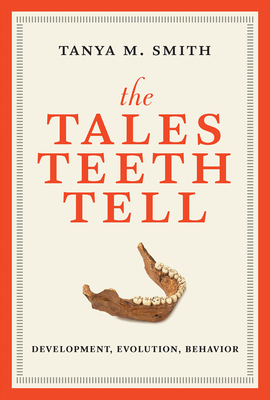 In The Tales Teeth Tell, biological anthropologist Tanya Smith offers an engaging and surprising look at what teeth tell us about the evolution of primates--including our own uniqueness. Humans' impressive set of varied teeth provides a multipurpose toolkit honed by the diet choices of our mammalian ancestors. Fossil teeth, highly resilient because of their substantial mineral content, are all that is left of some long-extinct species. Smith explains how researchers employ painstaking techniques to coax microscopic secrets from these enigmatic remains. Counting tiny daily lines provides a way to estimate age that is more powerful than any other forensic technique. Dental plaque--so carefully removed by dental hygienists today--records our ancestors' behavior and health in the form of fossilized food particles and bacteria, including their DNA. Smith also traces the grisly origins of dentistry, reveals that the urge to pick one's teeth is not unique to humans, and illuminates the age-old pursuit of "dental art." The book is generously illustrated with original photographs, many in color.